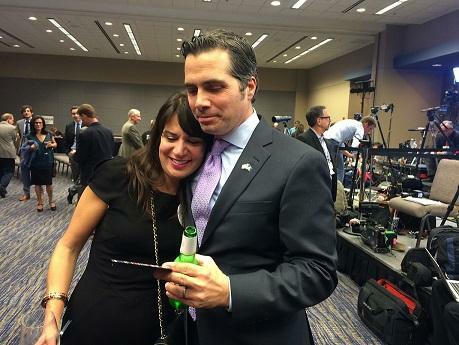 Greg Orman and a supporter on Election Night. Incumbent Pat Roberts held on to his U.S. Senate seat Tuesday after besting Independent Greg Orman. It was a surprisingly easy win for Roberts after a bruising battle to keep a place in Washington he's had for three decades. Roberts made his victory speech at the Republican watch party in Topeka. "We said for months the road to a Republican majority in the United States Senate lead through Kansas and we did it," said Roberts. With all precincts reporting, Roberts beat Orman 53 percent to 43 percent. Taking most of the counties in the western part of the state, Roberts gained an early lead from his core constituents, which he won with his cries against Obamacare, illegal immigration and the Democratic leadership in Washington. Roberts was just as tough on President Obama and Senate Majority Leader Harry Reid in his victory speech as he was on them during the campaign. Sen. Pat Roberts greets supporters after his victory speech. "Tonight Kansas stood up and said enough. Enough of the gridlock, enough of the failed leadership under President Obama and, yes, Harry Reid and enough of the unconstitutional maneuvers of an intrusive federal government," he said. Orman conceded shortly after 10 p.m., telling his supporters that they should be proud of the message they sent to Washington: that politicians can't go to Washington and hide behind a party label. "Although Sen. Roberts won tonight, we didn't lose," Orman said to a cheering crowd at the Overland Park Convention Center. "We not only ran against Sen. Roberts, we ran against the whole Washinghton establishment and Kansans and all of you in this room sent them a very strong message," he said. The race made state history with a record $27 million in spending, some $17 million of it from so-called outside groups, mostly Republican and conservative groups gunning against Orman. Orman, a wealthy businessman, didn't accept PAC money but instead used $3 million of his own money. Most advertisements painted him as a liberal Democrat with ties to President Obama and Senate Majority Leader Harry Reid, a charge Orman fought as misleading, citing the fact that he had given money to both Democrats and Republicans. The battle was a toss-up going into Election Day, with the latest polls showing Orman with a slight lead that fell within the polls’ margin of error. Just a month earlier, Orman had as much as a 10-point lead, but lost it when the Roberts campaign and his conservative backers hit back hard with barrage of radio and television ads. Roberts went on the stump, bringing with him a host of Republican celebrities, including Sens. John McCain and Rand Paul and former presidential candidate Mitt Romney. Orman barnstormed, vowing he wouldn’t be a “silent soldier” for either party, running against the very unpopular Congress as a whole rather than just Roberts. The last days of the race saw a final volley of hardballs, particularly a Roberts ad touting revered Kansas State University football coach Bill Synder’s alleged endorsement. After it began running Friday, K-State officials asked for it to stop airing, saying it was a violation of school policy for employees to promote politicians. Although an embarrassed Synder apologized and took the blame for allowing the incident to happen, the Roberts campaign was still airing the TV ad on Monday. The Roberts campaign also accused Orman of calling popular former Sen. Bob Dole of Kansas a “clown” after Orman labeled the “Clean Sweep GOP” bus tour “a Washington establishment clown car” (one pundit called it “Clownghazi”). Orman campaign manager Jim Jonas told the Washington Examiner that he has the “utmost respect” for Dole and that the Roberts campaign was trying to mislead voters. The Orman for Senate campaign headquarters is in a Shawnee, Kan., strip mall, next door to a Taekwondo studio and a few doors down from a Papa John’s pizza joint. Among the posters, bumper stickers and general flotsam of a fall campaign, a college yearbook sits on a small table.